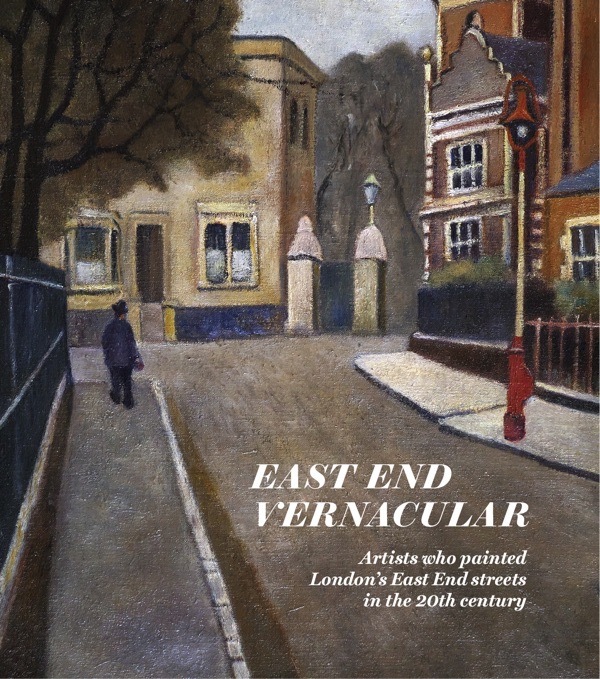 Thanks to the support from you, the readers of Spitalfields Life, I have been able to produce EAST END VERNACULAR, Artists who painted London’s East End streets in the 20th century and today is publication day. Below you can read an extract from my introduction to the book. Join me for the launch at the Nunnery Gallery in Bow, E3 2SJ, on Tuesday 10th October from 6pm. Courtesy of Bow Arts, there will be a special opening of their new exhibition THE WORKING ARTIST, The East London Group for Spitalfields Life readers. At 6:30pm, I will be introducing my new book and then signing copies in the gallery where some of the paintings by Albert Turpin, Elwin Hawthorne, Harold Steggles, Walter Steggles and other East London Group artists featured in EAST END VERNACULAR will be on display. There will be drinks and live music. Is the East End a place or a culture? The endless and unresolved debate over its precise location reveals that this is more than a question of mere topography. There is a consensus that the East End begins at Aldgate Pump, while its southern border is defined by the River Thames and its eastern boundary by the River Lea, yet the northerly edge of its territory remains ambiguous and ill-defined in Hackney. This confusion is compounded by those who say that Hornchurch or Leyton is the East End now, acknowledging its elusive and fugitive nature while simultaneously admitting the existence of a collective understanding among those who know they are in the East End, even if they cannot agree upon its geography. In the spirit of Humpty Dumpty, who told Alice that when he used a word it meant whatever he chose it to mean, I have coined East End Vernacular to describe those artists who set out to portray the East End in ways that appreciate both the human and the utilitarian nature of its environment. Many originated in the East End and were self-taught, which gave them an innate personal understanding of this cultural world. Yet their work is complemented by those that came from outside who were drawn by the distinctive quality of the place. Unsurprisingly, the human catastrophe of deprivation, disease and poor housing in the nineteenth-century East End did not attract painters as pictorial subject matter. Yet we have the engravings of Gustave Doré published in London, A Pilgrimage in 1890, dramatising the darkness and want so persuasively that his images persist in the popular consciousness to this day. Too often, the history of the East End is still restricted to a history of poverty, whereas I choose to explore a parallel history of resourcefulness, highlighting the persistent and dignified creativity of people who have forged their own ways of living in spite of widespread economic disadvantage. By contrast to Doré’s grim gothic visions, perhaps James McNeill Whistler was the first artist to appreciate the utilitarian environment of the East End on its own terms, seeing the beauty in it and recognising the intimate relationship of the working people to the urban landscape they had constructed. 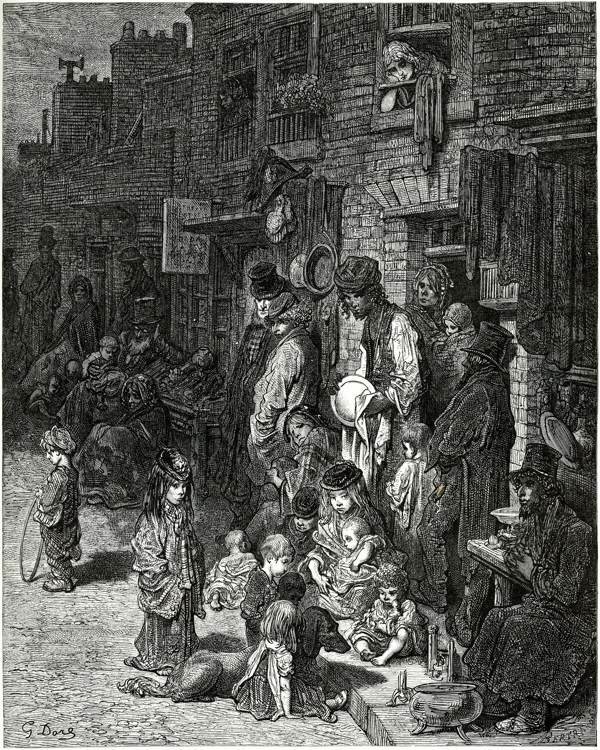 Crowded housing in the East End encouraged people to lead their lives in public, either on the street or in ‘public’ houses, creating a unique society premised upon an integral relationship with the built environment, which functioned as an exterior theatre for the congress of life. 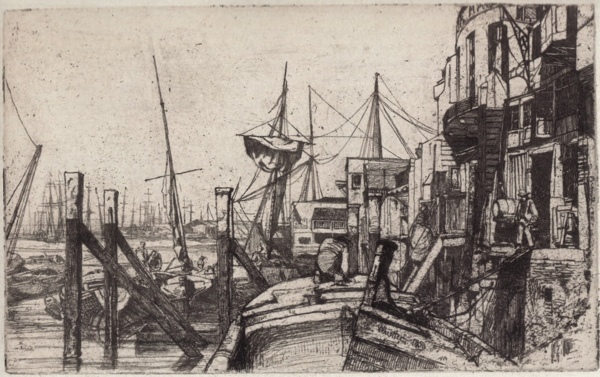 Many artists fascinated by Whistler’s vision came in his footsteps, some embracing his medium of etching, like Joseph Pennell, while others like Frank Brangwyn and Christopher Richard Wynne Nevinson were attracted by the spectacle of the docks and the life of the river. In contradiction to the widespread belief that artists only arrived in the East End towards the close of the twentieth century, I can report that when Charles Dickens came to Spitalfields in 1851, he visited a young artist in his studio. Dickens foresaw the end of manufacturing in the East End, while recognising the possibility for artists and designers to win esteem, and perhaps even a living, by creating and selling their work. In compiling East End Vernacular, I make no claim to present an exhaustive or definitive survey, merely to choosing those artists whose work appeals to me as revealing the most sympathy with and understanding of the subject matter. Neither can I assert the existence of an East End School of painting spanning the twentieth century, although I discovered that most of the artists featured knew of the work of several others and, in arranging the sequence, I was struck by the common qualities shared by many of these paintings. For these are personal pictures and, beyond that, many reveal an overt affection for the East End streets that inspired them. Ultimately, this is an heroic story of the triumph of artists with the talent and moral courage to pursue truthful images of the environment and society they knew intimately, defying adverse circumstances, including poverty and prejudice, through sheer force of creativity. The best of these paintings are by those who were at one with the world they represented, manifesting a vision that is both visceral and poetic. Throughout the nineteenth and for much of the twentieth century, the East End was considered to be the least cultured part of London by comparison with the more affluent areas, yet I have been able to assemble this magnificent selection of pictures representing the East End, many painted by artists from the East End, and I challenge anyone to uncover a comparable selection of twentieth century works as vital as these, entitled South, West or North London Vernacular. I’ll be in London soon and plan to purchase a copy. Wish I could make the launch party but I will miss it by a couple of days. Very best wishes and thanks for putting this book together. I’ve just received my pre ordered copy. It’s worth every penny. Very well made , a real treat to handle. I was happy to see Dan Jones featured. I went to work at Oxford House in the early 80′s and remember this larger than life , but still understated character. He didn’t know me , but I enjoyed knowing of him. Born and raised in the Stepney and Poplar , I am looking forward to discovering more about my East End. Good luck with this most excellent venture, I look forward to getting my copy. The East End is not a place that exists as it once did – in the sense of it being streets and houses, pubs and parks. It is a place carried by people who know themselves to be East-Enders, who were born in what was once a vaguely defined area of London but one that is no longer bounded by rivers or pumps. Those of us that were born in the East End of London will forever be East-Enders, carrying the soul of the East End with us on our travels. Those who came and lived in the houses we left behind are but visitors. As the people of Maine, New England say of those who move into their part of the world: “They’re from away”. Thank you for sending out my copy so promptly. It is a very handsome volume, and a tremendous credit to your all your work in bringing so many first-rate artists the attention they deserve. Congratulations, absolutely brilliant work!! A lovely book indeed, right up my street, so to speak, I received my pre-ordered copy the other day and can’t put it down. I was very pleased to see Doreen Fletcher’s inclusion, a much overlooked artist. I hope to be at the launch on 10th October. Thanks to the GA and Spitalfields Life, the editorial and production team for putting it all together. If you have any interest in East London or urban painting you’ll love it. My pre-ordered copy arrived Saturday – a real treat! Thank you for compiling a truly original colleection. Sadly I’m away on 10th October but I’ve alerted my friends to what sounds like a wonderful event. Have a fabulous evening! I received my copy yesterday evening. What a lovely book, right down to the texture of the cover and the solidity of the binding. A small treasure. And the paintings are like stepping into a dream. Thank you. I received my copy of East end Vernacular the other day .What a lovely book which I will treasure. Love all the photos too. Many thanks for producing such a wonderful book. Best Wishes to everyone. Mary Connolly. I received my copy about a week ago. Thank you for producing such a beautiful book. The superb quality of the reproductions is fitting tribute to the artists featured in its pages. 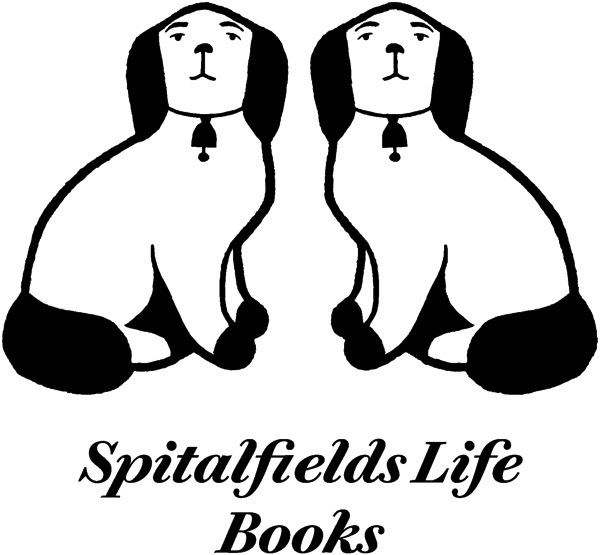 I have also greatly enjoyed the material you have produced about these artists in Spitalfields Life. Today I visited the Mile End to Mayfair exhibition at the Southampton City Art Gallery. It was a joy to see the paintings of so many of the artists you have featured and the book has given me a greater understanding of their work. I am looking forward to visiting the Nunnery next week. Congratulations on bringing together such an excellent collection. Though I cannot confess to any artistic leanings myself it is always to be admired and respected when someone champions an awareness of local talent. In many ways I can see this publication being of assistance to social historians of the future as well as being a colourful account here and now. I wish you well next Tuesday and fully expect a great turn out. Unfortunately I will not be one of them, located as I am in China. Thanks again for my ‘taste of home’ even though I am on the other side of the world.